And on a blustery and chilly Saturday evening at Seattle’s Lake Union Cafe, what a beautiful, elegant and fun-loving ceremony we crafted to celebrate such a loving relationship. Truth? A well-designed and well delivered ceremony goes by very fast. 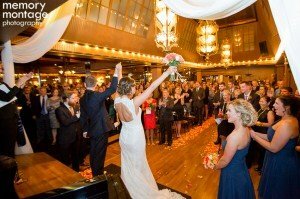 To “slow things down” and to create an “end of ceremony flourish,” I enjoy working with a couple (most often at rehearsal) to really ‘take in’ the final moments of a wedding ceremony. As you can see from Brad and Corrinne’s photo, they stopped – they enjoyed – and people absolutely loved their elation and joy. A ceremony is about the “give and take of emotion.” It is about taking advantage of emotionally packed moments to create forever memories. It’s about taking a moment…just a moment…to create a forever memory.